A number of important events happened in 2018 as Indonesia approaches the political year, presidential and legislative elections on April 17, 2019. The Alliance of Independent Journalists (AJI) noted many improvements in the media and journalism practices in 2018. However, the overall condition—especially concerning press freedom and professionalism—was not satisfying. Indonesia was ranked 124 out of 180 countries in the Reporters San Frontiéres’ (RSF) Press Freedom Index in 2018—RSF is a non-governmental organization based in Paris, France, that advocates freedom of the press and information. Indonesia ranked the same place as last year, much closer to the bottom than the top, indicating the country’s poor press freedom situation. Indeed, Indonesia’s position was better than its neighboring countries Philippines (133), Myanmar (137), Cambodia (142), Malaysia (145), Singapore (151), Brunei (153), Laos (170) and Vietnam (175). However, Indonesia was far behind East Timor at number 95. The Press Freedom Index is a snapshot of the media freedom situation based on an evaluation of pluralism, independence of the media, quality of legislative framework and safety of journalists in each country that highlights cases of violence against journalists and media. 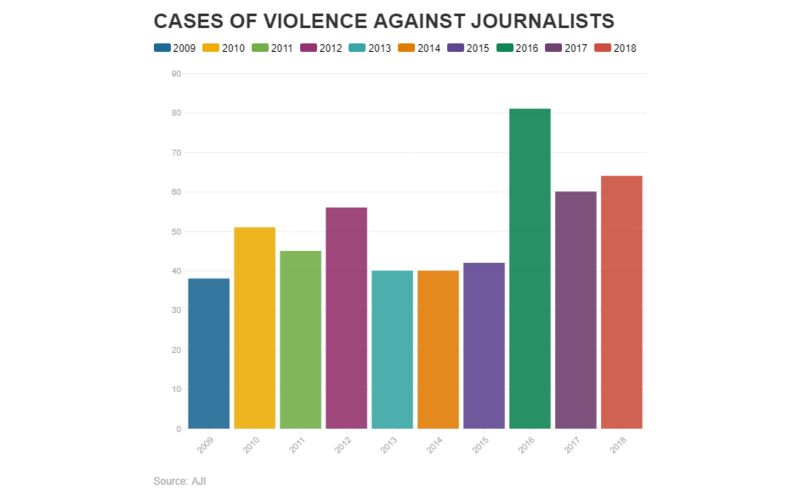 Based on the data collected by AJI’s Advocacy Division, at least 64 violence cases against journalists occurred this year. They were physical and non-physical violence, expulsion, reporting restrictions as well as the criminalization of journalists. The number of cases increased from last year of 60, a quite high number. In 2016, however, AJI noted the highest number of violence cases—amounted to 81. The lowest was in 2009 with 39 cases. Physical violence such as beating, hitting and other similar abuse happened the most in 2018. AJI’s data showed that from January to December 2018 as many as 12 physical violence cases occurred. Different kinds of violence that also happened repeatedly were expulsion and reporting restrictions as well as threats or terrors—11 cases each. Other violence was the damaging of journalists’ equipment and data such as cameras, videos or photos (ten cases), as well as criminalization (eight cases). The high number of physical violence cases was also the trend back in 2017 and 2016. In 2017, from a total of 60 cases, half of them were physical violence. While in 2016, 35 out of 81 cases were physical violence. In 2018, however, we noted new kind of violence that could become a worrying trend in the future. The violence was in the form of ‘doxing’ or online persecution. Doxing is the practice of researching or tracking and broadcasting identity or private information of a person online—in this case, a journalist whose coverage or comments were deemed irksome by certain parties or groups, usually on social media sites and applications. In 2018, online persecution happened to three journalists from Kumparan.com and Detik.com. A journalist from Kumparan.com was persecuted because she did not write ’Habib’—a title that has been bestowed on Muslims who have been able to trace their roots back to the prophet Muhammad—when addressing the Islamic Defender Front’s (FPI) leader Rizieq Shihab. While journalist from Detik.com was abused because of a story that included a statement from the Brotherhood of Alumni 212’s spokesperson (also FPI member) Novel Bamukmin. Another Detik.com journalist was harassed when he covered a rally called ‘Aksi Bela Tauhid’ (or Rally to Defend the Islamic Beliefs) on November 2, 2018. Kumparan.com journalist Kartika Prabarini received threats on her Instagram account after her media published an exclusive coverage on FPI’s Rizieq Shihab called ‘Menjinakkan Rizieq’ or Taming Rizieq. Ms. Prabarini was one of the reporters who wrote the special report that reviewed several legal cases faced by Rizieq Shihab. The leader’s supporters accused Kumparan.com of being disrespectful because, among several reasons, the media did put the Habib title before his name. A supporter of Rizieq Shihab, who went as @mastermeme.id online, revealed Ms. Prabarini’s identity on social media (doxing). The followers of @mastermeme.id also threaten and harassed Ms. Prabarini. They left many harsh and inappropriate comments regarding her gender and look. A team called Lawyers of Activists and Islamic Scholars threatened to report Ms. Prabarini as well as her media Kumparan.com to the police. The intimidation and doxing ended only after Kumparan.com editorial apologized. Mr. Bamukmin protested and claimed that he did not say ‘ask’ but ‘love.’ However, Detik.com insisted—as clearly heard in the interview tape—that Mr. Bamukmin did say ‘ask.’ Mr. Bamukmin then requested for a right of reply, but doxing and persecution nevertheless happened to Mr. Maulana. The video was shared accompanying with a text that said: “Detik’s journalist was caught red-handed wanted to paint a bad picture of Aksi Bela Tauhid by photographing the trash.” The video went viral on social media such as YouTube, Instagram, Facebook and messaging application WhatsApp. Users on Instagram and Facebook even broadcasted snapshots of the photojournalist’s identity card (KTP) and press card. Users also threatened the journalist on the Internet. These were not the first doxing cases that happened to Indonesian journalists—the number was actually increasing. In 2017 doxing happened to journalist Zulfikar Akbar who worked for sports publication TopSkor. He was persecuted because of his tweet. On his personal Twitter account, Mr. Akbar tweeted about then a hot topic related to conservative cleric Abdul Somad. The cleric was denied entry by the Hong Kong’s authorities. Mr. Akbar’s tweet was perceived insulting and it sparked the anger of Mr. Somad’s supporters. The cleric’s supporters threatened Mr. Akbar online. They said they would come to Mr. Akbar’s house and office. Because of the threats, TopSkor decided to fire Mr. Akbar. AJI closely monitored doxing practices against journalists and noticed that they usually resulted in persecution. In the past years, doxing and online abuse mostly happened to civilians or members of the public. AJI and other non-profit organizations joined the Anti-Persecution Coalition in 2017 to stop the trend. Tweets or other posts on social media must be regarded as forms of freedom of speech and expression, and thus anyone with different opinions must not overreact or threaten others that could provoke persecution, abuse or criminalization. Besides doxing, three criminalization cases also occurred in 2018. 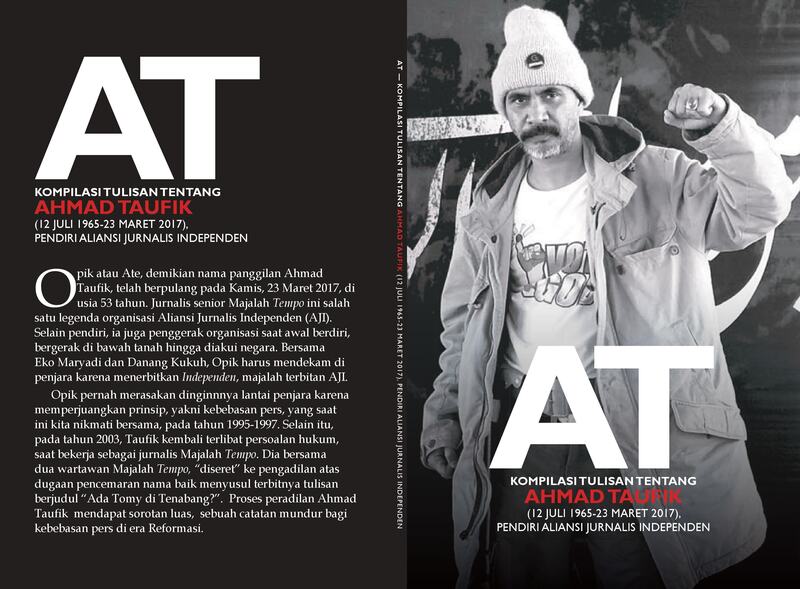 They happened to Editor-in-Chief of Serat.id Zakki Amali, Tirto.id journalist Mawa Kresna and one of the initiators of IndonesiaLeaks.id Abdul Manan. Mr. Amali was reported to the Central Java Police by the rector of Semarang State University (Unnes) on July 21, 2018. The rector accused Mr. Amali to have violated the 2008 Electronic Information and Transactions Law (UU ITE) Article 27 paragraph 3—which states that “Any Person who knowingly and without authority distributes and/or transmits and/or causes to be accessible Electronic Information and/or Electronic Documents with contents of affronts and/or defamation.” The report was triggered by Serat.id’s investigative series on the plagiarism allegations committed by the rector. The Central Java Police went on to proceed with the case and had summoned Mr. Amali for the second time on November 13, 2018. The same law was also used to try criminalize Mawa Kresna, Tirto.id journalist, who wrote an in-depth report about a syndicate that helped people to buy or sell university certificates and fake university programs. The special staff to the Minister of Research, Technology and Higher Education Abdul Wahid Maktub threatened to file a report to the police against Mr. Kresna. Mr. Maktub had appointed a lawyer from the Law Firm Sholeh, Adnan & Associates (SA&A) to follow up the case. While Abdul Manan, IndonesiaLeaks.id co-founder and AJI president, was reported to the Jakarta Police on October 23, 2018, for a criminal case and to the South Jakarta District Court for a civil lawsuit on October 24, 2018. The reports were caused by an investigative piece published by five media outlets in collaboration with IndonesiaLeaks—a whistleblower platform. The report, called “The Red Book Scandal,” exposed the spoliation of evidence that showed the transfers of big money from Indonesia’s Anti-graft Agency investigators (that used to serve in the Police Corps) to the Police’s elite. Abdul Manan and friends were reported by lawyer Elvan Gomez to the Jakarta Police under the Criminal Code (KUHP) Article 317 on charges of false complaints. The Police have yet to take further actions so far. While Mr. Gomez, on October 26, decided to withdraw the civil case report. For violence and intimidation against media and journalists, AJI noted two cases: Radar Bogor daily and Tempo Magazine. Around a hundred supporters of the Indonesian Democratic of Struggle (PDI-P) came to Radar Bogor office in Jalan KH. R. Abdullah bin Muhammad Nuh, Tanah Sereal, Bogor. Several people hit a staff who was on duty and broke some properties in the office. The PDI-P supporters protested Radar Bogor’s story published on Wednesday, May 30, 2018, under a headline ‘Idling Around, Getting Paid Rp112 million.’ The story talked about PDI-P’s chairperson Megawati Soekarno Putri who was appointed by president Joko Widodo as the chief advisor of the Agency for the Implementation of the State Ideology of Pancasila. The PDI-P supporters argued that the story was attacking the party’s leader. Hundreds of FPI members went to Tempo office on March 16, 2018. The leaders of the group stood on top of a car, demanded Tempo apologize. When Tempo Editor-in-Chief Arief Zulkifli and several other editorial team members met with the representatives of the mob inside the office, instead of having a constructive dialogue, FPI members were threatening and intimidating Tempo staff. FPI members denounced Tempo’s choice of word in addressing Rizieq Shihab, claiming that “Bapak” or “Pak” (Sir) was disrespectful. They argued that Tempo should have addressed him with the ‘Habib’ title. Besides the violence cases, laws and regulations that could be used to imprison members of the press were also a concern. The media and press community have known that there are at least two regulations that could be used to charge journalists in Indonesia: the Criminal Code and the Electronic Information and Transaction Law. In 2018, AJI recorded two other worrisome judicial moves done by the government and lawmakers: the revision of MD3 (Legislative Bodies) bill that was passed as a law through a plenary session on February 12, 2018, and the ongoing revision of the Criminal Code. There are several problematic articles in the MD3 Law. One of them indicates that criticizing lawmakers is a punishable act. It is reiterated in Article 122 letter (k) that regulates the duty of the parliament’s ethics council (MKD). The article says, “The MKD is tasked with taking legal action and/or other actions against a person, a group of people or a legal entity that disrespects the dignity of the House and its members.” AJI had criticized the article because it could be used in any given situations and against any kinds of criticism. The articles show that the parliament is anti-criticism. The definitions of criticizing and insulting are unclear in the law, and thus could be easily manipulated to criminalize journalists and media companies. Indonesian press, however, was hopeful when the Parliament said it was going to revise the Criminal Code because the set of laws was based on a penal code issued by the Dutch and many articles could be used to imprison journalists. However, so far, both the government and lawmakers seemed to want to keep the articles that could hamper press freedom—including an article on defamation. Both of the executive and legislative also have said they intend to reintroduce an article on insults against the president that was nullified by the Constitutional Court in 2006. Lawmakers have said that the revision will also include a new article on contempt of court. It is drafted in Article 329 letter (d) that says, “Publicizing or allowing the publication of anything that may affect the impartial nature of the judge in the court.” The article in the draft states that violators could be punished for five years. The article is of a sensitive nature for the press because judges or individuals could claim that media have influenced judges, for instance. AJI also had raised concern over Article 309 paragraph (1) on fake news. The article in the draft says, “Any person who broadcasts fake news or hoaxes resulting in a riot or disturbance shall be punished with a maximum imprisonment of six years or a maximum fine of Category III.” The phrase ’resulting in a riot’ in the article could be interpreted in many ways, thus prone to be used to criminalize journalists. The employment condition in the media industry in 2018 was quite similar to the country’s portrait of press freedom. It showed in the many labor disputes between journalists and media companies that were handled by the Legal Aid Institute for the Press (LBH Pers). In 2018, LBH Pers handled 11 labor cases that involved seven media outlets. Five cases were those of so-called the ’sunset’ of print media—owners closed down companies; one online publication that also stopped operating; and five cases of labor violations. The 11 cases affected 22 journalists and one media worker. The five print media that ceased publication were: subsidiaries of Femina Group (four companies) and PT Citra Media Persada that owned Tabloid Wanita Indonesia (or Indonesian Women Tabloid). The Communication Forum of Femina Group Employees (FKK-FG) demanded the companies to pay their salary fully—Femina Group has been paying their workers’ salaries by installments since 2016. The head of Advocacy and Research of LBH Pers Gading Yonggar Ditya said disputes in the Femina Group started in early 2016, and LBH Pers has been advocating the workers since. LBH Pers also helped nine workers from Tabloid Wanita Indonesia that were laid off by the company in early August 2018. The institute also advised on five other cases related to labor violations in six media companies. AJI believed that the same disputes might reoccur in the near future due to the changing of media landscape—some people called it the effect of the ‘sunset’ of print media. AJI’s Manpower Division has also been helping to resolve a dispute caused by a layoff against iNews TV’s journalist Qodriansyah Agam. On November 2018, representatives from AJI Makassar met with the management of iNews TV Makassar to ask about Mr. Agam’s dismissal. However, the management couldn’t give a solid answer. Mr. Agam is in ongoing communication with AJI’s team to resolve the case. Layoffs or other disputes should have ideally handled by Union Workers—an organization guaranteed by the law to help journalists and other workers in the media industry solve such cases or disputes. However, only a small number of companies have a union. Based on the 2018 Federation of Independent Media Workers Unions’ data, only 25 media outlets—out of thousands—at across the archipelago owned a union. Professionalism and ethics problems were also a serious concern in 2018. Since the beginning of 2018, AJI had noticed several media companies that signaled their support to one of the presidential candidates. It is inevitable because politicians, whose parties will compete in the 2019’s legislative and presidential elections, own some of the companies. Bias was also strongly expressed on social media, including by journalists themselves. Realizing the seriousness of the threat to media independence, on August 14, 2018, AJI released a call for journalists and media companies to prioritize public interest—not political parties’ or owners.’ AJI also urged journalists and newsrooms to remain independent, professional and follow the Code of Ethics or KEJ. Article 1 of KEJ says, “Indonesian journalists are independent.” To be independent, journalists must only consider the significance of news coverage for the public. Although we cannot deny that media companies will always try to make profits, the ‘money’ reason must not be taken as the main or the only reason in deciding assignments. On the social media-related issues, even though we all agree that expressing opinions on social media is part of the freedom of expression and is protected by the Constitution, journalists have to be encouraged to remain partial on the cyberspace. Journalists’ opinion or expression in front of the public (including on social media) concerning certain candidates could impair their independence and put them in a complicated situation at work. Journalists are also not allowed to take up a position with political parties’ campaign team—official or unofficial. The 1999 Indonesian Press Law states three main functions of the media; they include providing ‘education’ and performing a ‘social control function.’ In the time of presidential and legislative elections, reporting should be aimed at carrying out the mentioned functions. The report featured stories from two female journalists from Malaysia and one from Indonesia. The three journalists shared their harrowing stories. The abuse was done via text messages, physical contact, and ‘special’ dinner invitations by sources. Frustratingly, when the female journalists reported the assault to their editors, they did not care. Instead, the editors asked them to use their connection to get exclusive stories. In the past three years, harassment cases started to surface. The three prominent cases happened in Jakarta, Ngawi (East Java) and Medan (North Sumatra). The first was the sexual harassment that happened to four female journalists at state-owned news agency Antara in Jakarta. The second was the abuse against a junior reporter at Radar Ngawi. The perpetrators in both cases were their superiors. The third was sexual harassment against a reporter in Medan done by a security guard. AJI and Malaysian NGO Gerakan Media Merdeka (Geramm) released a joint statement on January 19, 2018, urging related parties to end harassment against female journalists. Such cases have been ignored for too long and deemed unimportant, even ‘normal’ as part of the consequences of the interaction between journalists and their sources. AJI and Geramm believed that media companies should seriously respond to harassment reports and consider formulating a new policy to stop the ill treatment from happening again. Media outlets should draw a solid line between sexual harassment and good relations. We also urged sources to respect all female journalists.